The California Economic Summit has unveiled three ambitious new goals—the One Million Challenges—that will be the focus of its growing coalition of business, environmental, labor, and civic leaders at the next statewide Summit next week in Ontario. With Californians facing a widening opportunity gap, fast-rising housing prices, and dwindling water supplies, the Summit has highlighted three elements of its 2015 Roadmap to Shared Prosperity that must be accelerated in the years ahead for the state to thrive. How will the Summit accomplish these goals? The Summit Playbook offers more detail on each of these challenges, along with a set of action plans that will be the top priority of the Summit network in the year ahead (Click here to download the Playbook). “These challenges represent some of the fundamental issues facing California, and they have attracted the attention of many different groups across the state. What makes the Summit unique is its collective focus on finding solutions that meet the ‘triple bottom line’—simultaneously growing the economy, improving environmental quality, and increasing opportunity for all,” said Summit co-chairs George Shultz, a distinguished fellow at the Hoover Institution, and Leon Panetta, chairman of The Panetta Institute for Public Policy. In its first three years, the Summit has showed this approach can achieve results. Since the inaugural event in 2012, more than 700 experts and practitioners from across the state have been working together on action teams that have established a track record of success, from major new state investments in workforce training to powerful new local authorities for building infrastructure. Now, with the One Million Challenges, the Summit has worked with its growing network to develop an even more ambitious set of targets—each of which will be critical to California’s sustainable economic growth. “This year’s Playbook lays out a strategy for accomplishing these goals, but our success will also depend on expanding our coalition,” said Summit Steering Committee co-chairs Paul Granillo, president and CEO of the Inland Empire Economic Partnership (IEEP) and Eloy Oakley, superintendent-president of Long Beach City College and a member of the University of California Board of Regents. There, too, the Summit has been making steady progress. Joining the IEEP as co-host of the event this year is the Southern California Association of Governments, the nation’s largest regional metropolitan planning organization, representing six counties, 191 cities, and more than 18 million people. 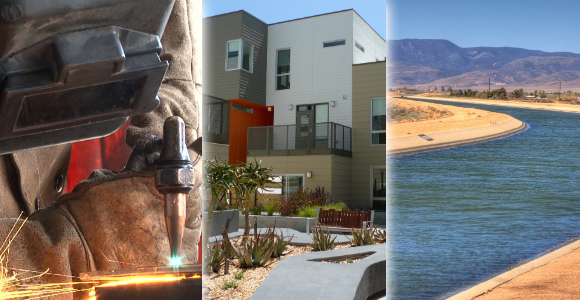 The California State Assembly Committee on Jobs, Economic Development and the Economy will also participate this year—hosting a hearing on the state’s role in building an inclusive economy. Dozens of state and regional policy leaders will be attending, including Lieutenant Governor Gavin Newsom, Treasurer John Chiang, Secretary of State Alex Padilla, Controller Betty Yee, University of California President Janet Napolitano, and California State University Chancellor Timothy White (Click here for a complete Summit program). This is the work of the California Economic Summit. Next week, with the One Million Challenges as a target, it will be renewed again.